We all know the hassle of transferring pictures from our digital cameras to the computer. Furthermore, when we want to upload them to an online service, it’s even worse. There’s no automation for lazy people like yours truly. It’s one of the reasons why I take most of the casual snaps with a phone: phone pictures automatically get uploaded and organized on my hard drive as soon as it enters Bluetooth range. 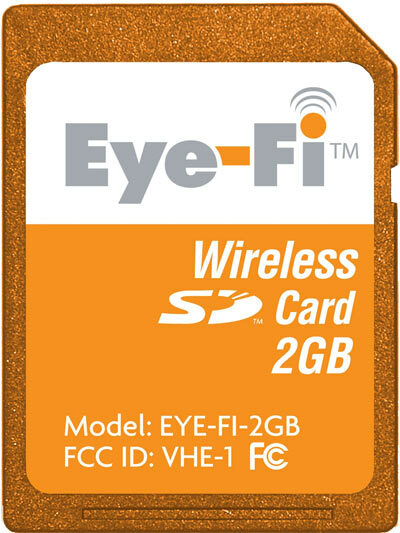 A company called Eye-Fi has come up with the solution to this problem: a SD card with built-in WiFi and a smart software suite. It does some pretty cool things beyond just storing your pictures in those 2GB. The age of wires, card readers, card adapters and so on might just be over with this little gizmo. Even though having WiFi in your camera is cool enough, the strong point of this solution is its software. It can be programmed to upload photos to the web anytime you are at a hotspot, for instance. This way, your holiday pictures can go to Flickr while you’re on holiday automatically, without needing a PC and all the hassle, all this while you’re enjoying a cocktail at a local lounge (which, of course, has a hotspot). More than that, after passing through Eye-fi-s servers, the pictures can go directly to your PC. That’s practical… You get back your free space on the card and will find the pictures already on your computer when you return home. This is definitely high on my wish-list. The digicam will – once again – be lugged around wherever I go, as a lot of the lazy factor goes away. More info at Eye-Fi; Found via Sci-Fi tech. Here’s a close-up of the card… The color is a bit tacky, don’t you think? Luckily, it’ll stay well-hidden in the camera.